bol.com & Xebia are happy to present to you another meetup on software quality. 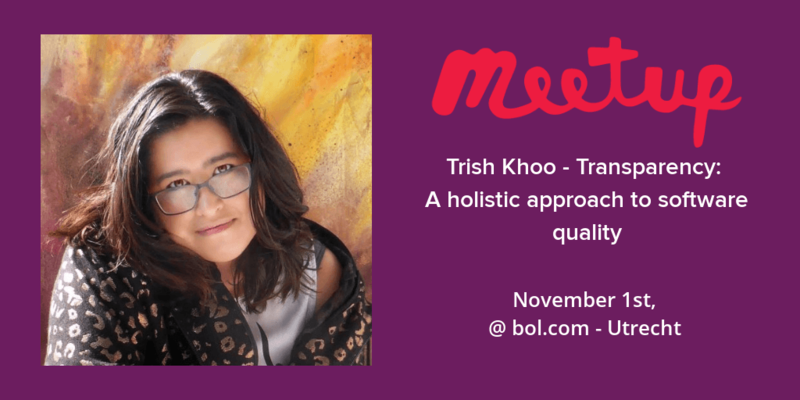 This time we will have Trish Khoo, keynote speaker at Agile Testing Days 2018, who will present her holistic approach to software quality. - how shifting focus from testing to transparency can turn an ordinary tester into a super tester. - new ways to interact with your team to improve information sharing. Trish Khoo is a consultant, artist and international keynote speaker. She has over 15 years of experience in the software industry, specializing in software testing and automation. Her journey has taken her from Microsoft to Google, from London to San Francisco, and many places in between. Now she helps companies all over the world with their testing needs from her home base of Brisbane, Australia. She also dedicates time towards fostering a strong local tech startup community and mentoring other technologists. When she's not doing this, she's working on her creative pursuits - artwork, singing and writing.